Violinist CYRUS BEROUKHIMs luxurious sound and innate eloquence consistently draw in audiences around the world. 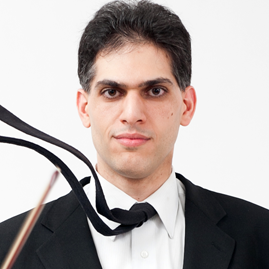 Recently appointed as Associate Professor of String Studies at NYU, he continues to perform as soloist, recitalist, and chamber musician, appearing at major venues including the Theaterplatz and Paul Klee Zentrum in Bern, Novell Hall in Taipei, Lobero Theatre in Santa Barbara, Kravis center in Palm Beach, The Barns at Wolf Trap in Washington D.C., Qualcomm Hall in San Diego, Ravinia Festival in Chicago, and various halls throughout Germany, Luxembourg, Japan, and Israel. His performances of Bach and Vivaldi Concerti with the Academy of St. Martin in the Fields were heralded as flawless and sensitive by the Zeitung im Espace Mittelland (Switzerland). As a member of the New York City Ballet Orchestra since 2009, Mr. Beroukhim has been featured as soloist in the production of Concerto Barocco, choreographed by George Ballanchine. He has also appeared as soloist with the Milwaukee Symphony Orchestra, New York Symphonic Ensemble, Oakland East Bay Symphony, and several Baroque and chamber orchestras throughout the United States. Cyrus Beroukhims diverse musical activities are a reflection of his passionate interest in different genres of music. Of Persian descent, Mr. Beroukhim regularly premieres works by Iranian composers and was personally invited by Queen Farah to perform at her sons memorial, broadcast to millions of viewers worldwide. In 2007, he founded the Zukofsky Quartet and immediately tackled the most challenging music of todays living and recently deceased composers. The quartets performances of the complete Milton Babbitt cycle were praised as supple and polished (The New York Times) and making the daunting and very difficult, beautiful (Chicago Tribune). As a member of Classical Jam, an ensemble that explores the music of different cultures through original compositions and improvisation, he continuously pushes the envelope of classical music in a rapidly changing world.